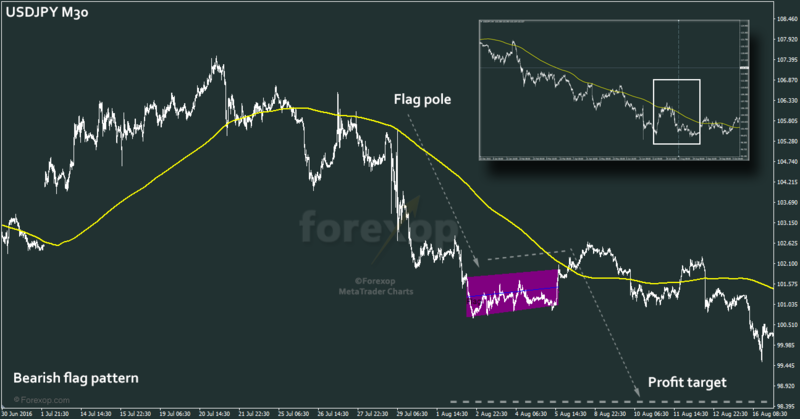 A flag is a continuation signal that can indicate that a trend is pausing rather than reversing. This pattern is closely related to the pennant – it’s called a flag because it forms when a strong rally is followed by a short correction which resembles a flag and a pole in the chart. Trends appear in forex charts at all scales and so do flag-like patterns. In this post we’ll examine how to trade both the bullish and bearish forms. As with other technical patterns, identifying flags is a subjective effort. It’s sometimes more of an art than a science. However, there are objective charting tools on hand. To help locate them you can use our pennant and flag indicator. You can use this to back test any trading strategy based on these structures. The diagram in Figure 1 shows the prototype flag in both of its forms. The basic difference between the flag pattern and the pennant is the body. The body of the flag is rectangular whereas the body of a pennant is wedge shaped. The flag, like the pennant gets its name from the distinctive shape. It looks like a flag on a stick. The price line leading to the flag’s body is “the flagpole”. 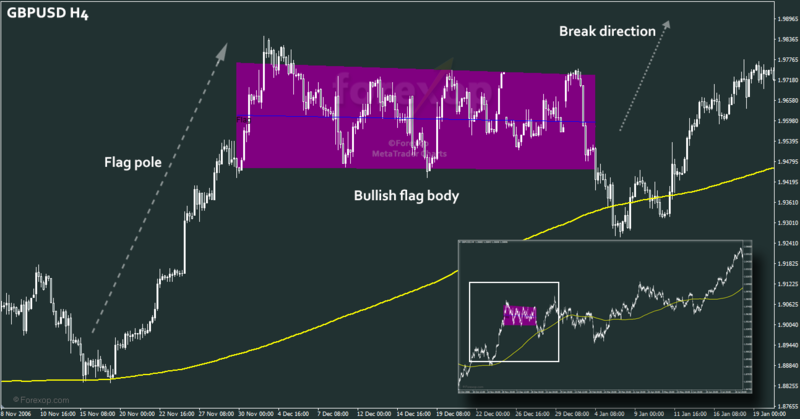 The market behavior during the formation of a flag can be understood in a similar way to other continuation patterns. There are three phases. To put it another way, the flag itself marks a brief correction in a trend. To be a valid pattern, the flag needs to satisfy some basic criteria. Firstly the body of the flag should align in a different direction to the trend. The body may be horizontal or nearly horizontal in some cases. The body should not be aligned with the trend. It’s important to note the difference. If it is, the market is unlikely to breakout with sufficient strength to make the trade worthwhile. Let’s look more closely at the trading setups for bullish and bearish flags. Like pennants, flags can create excellent opportunities to enter a trend during a brief respite or even a reversal period. When a clear bullish flag pattern forms, it’s usually a good indication that the trend will continue after a corrective period. If you’re scanning a chart and trying to decide if the market is forming into a flag, do the following. First establish that the two main components are there. The leading marker of the pattern is the flagpole. This should appear as a strong upward move meeting little resistance on the way. In Figure 2 this is marked as the flagpole. In this example EURUSD has made an upwards move of nearly 600 pips. In the next phase the market meets strong upper resistance and starts to consolidate sideways. This forms the body of the flag which is marked with a purple box. To trade this we’d place orders to buy at or around the end of the box. In this situation the market is still volatile. 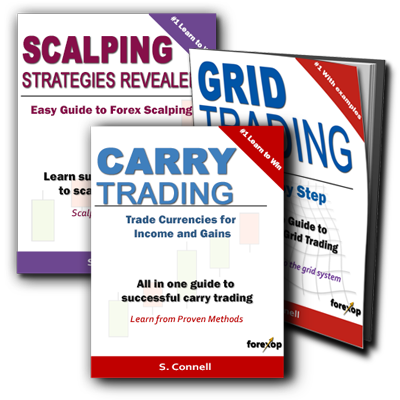 Therefore the best strategy is to average in to the market by placing a sequence or grid of buy orders at that point. When deciding a profit target, we use the size of the flagpole as a guide. One school of thought is to place the target at the same distance above the current level. So that would be 600 pips above the central axis line. However it is sometimes safer to go slightly less than this and look to place the exit at around ½ to ⅔ of the distance. Keep an eye on any support and resistance areas as these will help. Ideally, you should aim to place the stop behind a support/resistance barrier and the profit in front of a barrier. When is a bullish flag complete? This next example shows another bullish flag, this time on the chart GBPUSD H4. One of the difficulties of trading flags as opposed to pennants and other triangle patterns is that the body of the flag doesn’t form into a tip. This means you don’t have a precise signal as to when or if the pattern is ever complete. Figure 3 shows a flag forming in the purple box. The market then falls through the lower support line and this breaks the pattern. It then appears to be starting a new downward break. This leg reverses shortly afterwards and the trend does in fact extend powerfully upwards for some period of time afterwards. There wasn’t a clear trigger for the trade because the price fell well below the box. Another tip when trading flags is to prepare for some excessive volatility during the breakout phase. Again, when trading these sorts of patterns it’s advisable to use a staggered order entry system and some judgement in placing stop losses based on the chart. In the example above, the market retraced about half of the flagpole height on exiting the rectangular area. 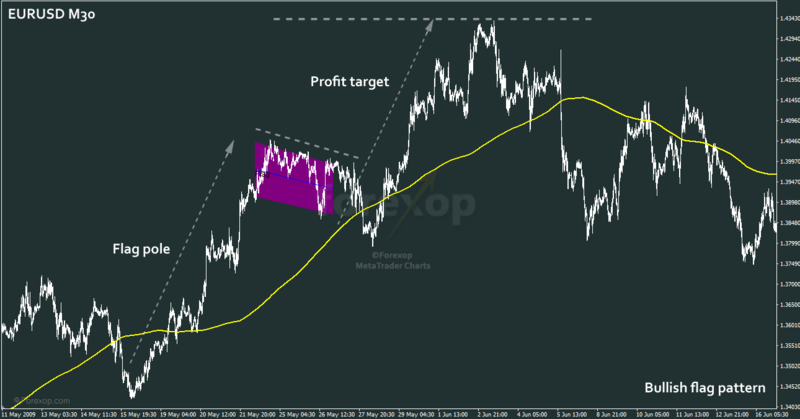 With a profit target of around one half, to two thirds, this would be the maximum distance for placing the exit points. The bearish flag pattern is the mirror image of the bull flag. Whereas the bullish flag is a rising staircase, the bearish flag is a falling staircase. The flag body represents a step. Figure 4 below shows a bearish trend on the GBPUSD hourly chart. Here you can see a very wide and narrow flag pattern forming during a steep descent. In this case the body is well defined and the price remains within the rectangular box for some time – unable to break upper resistance or lower support. Finally a decisive downwards break happens and the price moves well below the lower support line. The trend then resumes it’s downwards path. The small box on the left shows how the compete trend develops. When trading the bearish side we use the same rule as above. Use the flagpole as a guide to the likely breakout strength and direction. In this case it’s around 300 pips. The downward break does in fact exceed this in nearly one complete move. Again, averaging into the short position can reduce risk. We’d place several sell orders after the pattern is complete and once the price breaks the lower support. When trading manually, this can be done as the pattern is still forming. In this example the rectangular area was very elongated and many hours long. The whole pattern develops over a two week time span. This final example shows another bearish trade. Here on the USDJPY thirty minute chart. In this example the final breakout isn’t a clean one. Rather the market bumps along before finally dropping a short distance. The box on the top right shows the complete trend. In this case, the bearish trend is already over-extended at this point and the market is in an oversold state. The best action here would be to avoid the trade altogether in the light of other information. 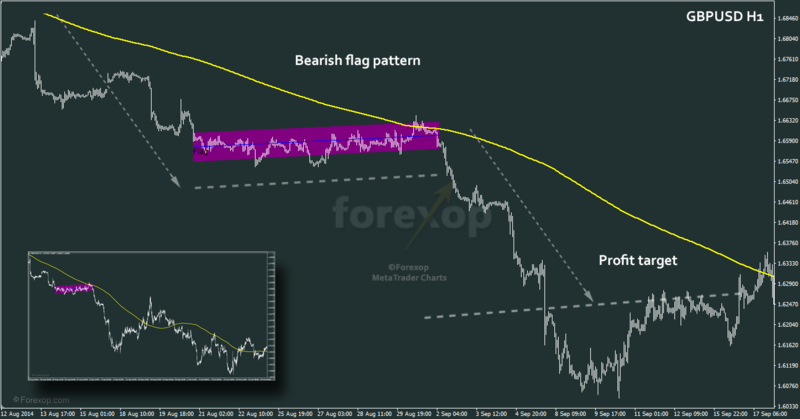 Flags are useful continuation patterns that often mark a brief pause in a trend. They appear in both bearish and bullish forms. Slightly more difficult to trade than triangular patterns, they usually require some caution when entering the trading position. To improve profitability we always average into the position and make use of support/resistance barriers. I have a colleague who has already achieved a 120% “Year rate”, with 900 trades in 10 years, using only 3 patterns in the Dax 30 market ! Q1) Are there other patterns that will give me better results ? Or do these have to be improved? Q2) What is your opinion for the Win/Loss ratio found ? Q3) The total of trades found (> 200 in 10 years for Cac40) is sufficient for the results to be credible ? Thanks for sharing these results. How is the average yearly profit worked out? What’s the expectancy of the systems? The win ratios you have look good on the face of it with the stops and take profits you used. But what was the reason for choosing those? 11.5% is a massive move for an index to make in 7 days so what percentage of trades reach the take profit before the time stop? The number of executed trades is quite small given it is over 10 years. Would be useful to see the result over a higher volume and then forward tested on other markets to verify there isn’t any data fitting going on. That can be unintentional but it does happen and should be eliminated. Can you explain a bit more about your method for detecting the patterns as well because there can be huge variation depending on the system being used. You can have two different methods but those will often pick entirely different trade entry times. And that obviously makes a difference in terms of the trading profit. Thanks for a helpful article. I understand it better. If it was a flag how do you tell the difference just by the shape? It always has to go the other way to the trend to trade it?